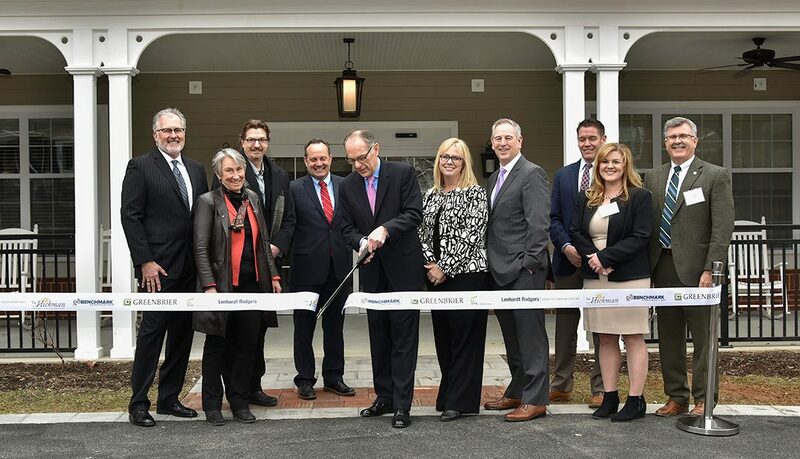 WEST CHESTER, Pa. – On Friday, March 16, 2018 The Hickman Friends Senior Community of West Chester welcomed more than 100 guests to a ribbon-cutting and reception to celebrate completion of their new Anna T. Jeanes Building at the corner of North Walnut and East Marshall Streets. Mark Snyder, Chair of The Hickman Board of Directors, served as emcee for the event. He pointed out that the Board had exhibited vision and perseverance for 10 years to make this building a reality. Mark also acknowledged the generosity of their donors, the dedication of The Hickman staff, and the work of the project coordinators. Tony Teague, Vice President of Greenbrier Development, Inc., spoke about the local economic development benefits and emphasized that it was a very complex project on a small piece of land. “There were dozens of subcontractors and vendors in this region who all came and worked and built this building,” said Teague. With the completion of the new three-story building, The Hickman community adds 74 additional suites to its already 40 suites in the Hickman Building. To address the growing need for memory care among senior citizens, the first floor of the new Anna T. Jeanes Building houses a secure memory care neighborhood with 22 private and shared studio suites and a secure outdoor garden. The second and third floors of the building have 52 personal care one-bedroom and studio suites. The new Anna T. Jeanes Building at The Hickman honors the life and legacy of this 19th century Quaker and philanthropist. Jeanes lived in Philadelphia from 1822-1907. She grew up inspired by Lucretia Mott and other pioneers of the movement against slavery. When she inherited a family fortune, she carefully planned how she would support causes that were important to her, including the elderly, the education of African American children, and hospitals. In 1896, she gave $200,000 to set up eight Quarterly Meeting homes for elderly Quakers. The Friends Boarding Home of Concord Quarter, which began in 1891 and is now known as The Hickman, was a recipient of some of these funds. Jeanes’ Estate, managed by Philadelphia Yearly Meeting, continues to benefit older adults at The Hickman and other senior communities in this region. Photo Caption: Representatives of the members of the Project Team (left to right): Ken Witek, Hickman Board Member; Joyce Lenhardt, Lenhardt Rodgers Architect + Interiors; Barry Stingel, AdvancedGeo Services; Tony Teague, Greenbrier Development; Mark Snyder, Hickman Board Chair; Stacey Fuller, Gawthrop Greenwood; Mark Yoder, Greater West Chester Chamber of Commerce; Steve Conway, Stephanie Kline and Mike Callahan of Benchmark Construction.